Some people are very diligent in doing everything right to lose weight. They even note everything so that when they gain the weight back, they will have everything recorded so that they know exactly how they lost it so that they can start over. Somehow, we are programmed for our weight loss to be temporary. We believe that the weight will come back. Interestingly enough, it does. It is the same for every goal in our life. Whether connected to weight loss or not, we set objectives, we stick with the plan for a while, and them sometimes, go back to the old bad habit. Not because it is the reality, but because it is our belief about reality. Changing this belief is key in order to make your efforts temporary and your new lifestyle permanent. It is like you have your own thermostat set at a specific temperature. 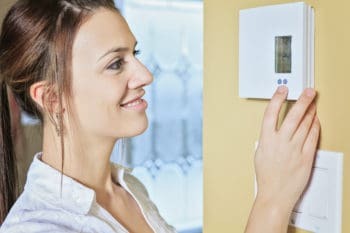 If for some reason, the temperature gets colder or warmer, your thermostat will sense it and will work behind the scenes to re-establish the set temperature. After having kids, or after moving to a different city or after quitting hockey three times per week, you may have gained weight. Somehow, your brain has accepted this new weight to be your new standard. Refuse it. Decide what you want your normal to be and get back there. Reset your thermostat. Adjust it to the weight you want and create a compelling image in your head about this being the weight that you will now have for the rest of your life. Remember how it felt to be this size. What people told you. What you were saying to yourself in your head when you were in that great shape. If you cannot remember a time when you were smaller than you are now, create a new movie in your head of how it would look like and feel like. I am on my way to go back to my normal weight. I am resetting my new normal to my ideal weight. I am willing to learn how it feels to love my body and myself.